The concept of precast segmental bridges is not new: the first application documented was from the mid-1940s, designed by Eugene Freyssinet and built over the river Marne near Luzancy in France, between 1944 and 1946. Although innovative, it also contained traditional wet concrete joints between the members. The impressive breakthrough came slightly later with the introduction of match-cast joints by Jean Muller, first for a bridge near Buffalo (USA) in 1952, and later for a bridge across the River Seine at Choisy le Roi near Paris in 1962. This opened the way for a large number of new developments in terms of design, production approaches and construction techniques, and precast prestressed concrete segmental construction became rapidly one of the most efficient and successful bridge construction methods all over the world. These developments are still evolving, but the interaction between design, production and construction is a critical factor for success: the interaction creates opportunities to optimise the scheme, but at the same time is crucial to ensure safety, especially during construction, when large weights are moved, placed and secured, frequently at substantial heights. 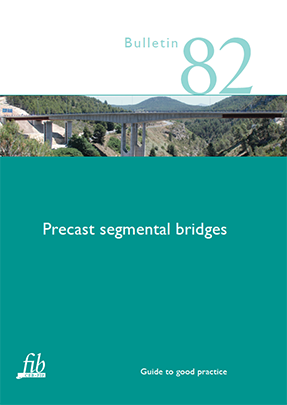 Engineers of all disciplines involved should interact during the development and realisation of precast segmental bridge (PSB) schemes, to conclude the optimum method statement and consequently check all the intermediate steps of the method statement in terms of stress, stiffness, stability, production and constructability. With the ongoing development of the PSB concept, and consequently moving limits in terms of dimensions, it was concluded to be appropriate to develop a Guide to good practice for the PSB construction method. The present report was developed by an integrated team of engineers with roots in design, structural engineering, production and construction, and provides a valuable source of knowledge, experience, recommendations and examples, with particular emphasis on the fib Model Code for Concrete Structures 2010 and fib Bulletins 20, 33, 48 and 75. I would like to thank all the members of Task Group 1.7, all the individual contributors from outside Task Group 1.7, and the reviewers of the Technical Council of the fib for their contribution to this Guide to good practice. In particular, I would like to thank Gopal Srinivasan and Marcos Sanchez, who, apart from their own contributions, did the final editorial work for this bulletin. Prof. Aad van der Horst, M.Sc.